Just as the General Synod of the Church of England was sotto voce congratulating itself on finally looking at its multiple failures towards its victims, a decision was being made to create another one in the unlikely form of Mrs Barbara Whitley, the 93-year-old niece of the late Bishop George Bell. It was not deliberate of course. They were just following orders, or in this case policy; policy that was being created on the hoof because Lord Carlile had told them how poorly their first effort at investigating 60-year-old allegations had been organised, and so they have been hurriedly playing catch-up. After all she has suffered over the past few years, Mrs Whitley clearly qualifies as someone for whose welfare and emotional health the Church of England should have regard. We are told that “fresh information” has arrived concerning the late Bishop. From the appropriately measured terminology it is not a new victim or fresh allegation(s), but plainly such information could not be ignored. It may or may not be a well-founded concern. But we cannot know. Last December, Mrs Whitley would have taken comfort from the Carlile Report on the simple basis that if the original conclusion of the church’s Core Group is unsupportable through defect of process, then the reputational status quo ante applies. The Archbishop of Canterbury rather publicly does not agree, but in the Court of public opinion he is probably in a minority. With the new matter placed prematurely in the public domain – against Lord Carlile’s specific advice – Mrs Whitley might have regarded that as simply the church’s token saving of face at a point when its sub-optimal competence in the handling of a historic case had been evidenced and asserted. ‘Look how transparent we now are’ is a way of kidding ourselves that things were/are not as bad as they were/are. Those dealing with this new information acted with speed, but they had a problem. The old regulations which contributed to the errors referred to in ‘Bell 1’ were still in place; the House of Bishops have not yet formally accepted the Carlile Report; Church House was hurriedly drafting new regulations to address the need identified by Lord Carlile for a deceased accused to be represented at the Core Group. They wanted to ‘get on with it’, which is to be commended, but under pressure they gave themselves the unencumbered power to appoint the person who should represent that accused. Seeking the opinion of the family was plainly overlooked. When Desmond Browne QC volunteered his services to Mrs Whitley, she was no doubt pleased that her long-dead uncle would have the previously denied skilled advocate at the table to evaluate and challenge evidence, assumptions and conclusions, and to make submissions as the matter unfolded. In this position, of course, he would not be participating in the making of the decisions, and could legitimately be asked to withdraw during decision-making deliberations. Core groups were once commonplace for me, with familiar modes of operation. Unfortunately, so far as I can ascertain, nobody making and shaping decisions on behalf of the church has any such personal experience of what is all in a day’s work a safeguarding lawyer. But, inexplicably, Mrs Whitley’s choice of advocate was denied by the church. Upon hearing of this decision, my fellow Synod legal colleague David Lamming and I presented a carefully evaluated case for letting Mrs Whitley have her wish, buttressed by warnings of the highly predictably adverse PR consequences for failing to do so, enhanced with entreaties and exhortations to ‘do the right thing’. We had a prompt meeting with those who made and defended the refusal. We appreciated their willingness to listen, putting the case I now share, without success. It should not have been necessary. We can over-intellectualise these matters, but the man on the Clapham omnibus could have advocated the case for Mrs Whitley having her free choice of lawyer succinctly. It was, in John Cleese’s succinct if not-quite-biblical phrase, ‘bleeding obvious’. George Bell’s niece is an elderly lady. 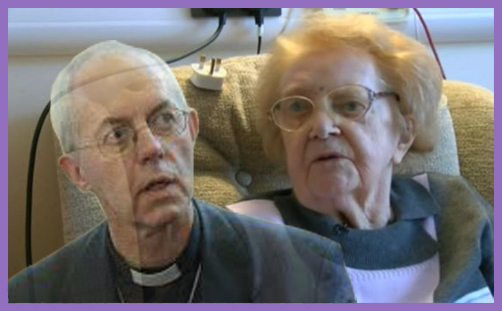 She has suffered and continues to suffer prolonged anxiety as her long-dead relative has been and continues to be publicly traduced by the Church of England on the basis of a single uncorroborated allegation brought 60 years after the event, all as a result of inadequate process that need not be restated. You might have expected a compassionate and contrite church to have been on its mettle, but, as usual, the consideration of the little people gave way to what can best be described as institutional bullying – which will come as no surprise to the many dissatisfied victims of abuse at the hands of the church, some of whom gathered outside Church House the following day. I am puzzled that so many sincere and ethically-aware Christians cannot see that one of the best ways of honouring past victims is not to create new ones. Mrs Whitley is unquestionably a victim of the Bell allegations, whether they be true or not. Whatever the truth, she has suffered grievously. I have previously observed that Safeguarding hurts everyone involved; it is like a road accident in which innocent bystanders who observe the tragedy suffer, sometimes substantially, albeit in a different way from those immediately involved. Everybody with experience of the field knows that. But Church House decision-makers evidently do not. ‘Father forgive them, they know not what they do’ may offer our errant church servants future hope, but it should not dissuade us from trying to divert them back onto the straight and narrow of good secular practice in the here and now. The more I have thought about it, the more the case for Mrs Whitley being permitted to have her choice of lawyer is unanswerable. First instincts will get you there, but deeper consideration will help. Having had fruitless discussions trying to avert the PR disaster, I am, of course, happy to accept that if you have neither the time to philosophise nor the assistance of a background of daily engagement with the field, you might get it wrong, especially if, as Lord Carlile underlines, your first priority is the protection of the church – even at the expense of little people like Mrs Whitley. The case for acceding to Mrs Whitley’s wish is biblical, jurisprudential, practical and pragmatic. It was also what was intended by Lord Carlile, who rightly and predictably ‘went through the roof’ when he heard what had happened and supported her request. Let’s spell this out plainly: the eminent lawyer entrusted by the Bishops to advise on proper practice supports Mrs Whitley. Micah 6 is a good biblical starting point if one notes the order of priority of the text. First we are to do justice. Permitting an independent choice of representative is part of that. We must love mercy, which surely implies mindfulness of the hurt we are inevitably causing the entirely innocent Mrs Whitley. And we are to walk humbly with our God. Walking humbly connotes early acknowledgement of our errors, as in this case. We might also bring to mind the Parable of the Unjust Judge (Lk 18:1-8) who is nagged into an undignified climb-down because if he doesn’t, he can’t get on with his other work. Archbishop Justin is not yet the Unjust Judge; he did not make the decision or draw up the rules, but if he imprudently defends the indefensible, he will become so. We must help and beg him not to fall into the trap that looms. Desmond Browne QC is a former head of the Bar Council, and moreover one of the country’s leading experts on matters of reputational damage. He knows the Bell case well, and is well acquainted with the Carlile recommendations. It is not only difficult but impossible to imagine a better or more qualified advocate for George Bell’s niece. But Mrs Whitley’s entirely reasonably request has been refused. Instead, the National Safeguarding Team has nominated a man called Donald Findlater. He is not known to Mrs Whitley, which is unfortunate enough, but Mr Findlater is not even a lawyer. That is not insignificant given that it took lawyers understanding these matters far better than the NST to uncover the deficiencies of the original ‘Bell 1’ case. Mr Findlater comes from a probation background and is associated with the victim campaigning group StopitNow! This is an entirely worthy cause. It is not, however, obvious that it is the best basis from which to demonstrate either independence of thought or the entirely separate legally forensic skills needed to defend the interests of an accused. That is a perspective notably absent from his CV. Mr Findlater appears to be closely associated with the Lucy Faithful Foundation – one of the handful of contractors to provide Risk Assessment services to the Church of England through the NST. The NST appears not to have considered adequately either the potential conflict of interest inherent in the current relationship between their respective organisations, nor the principle that justice must not only be done but be seen to be done. In the ‘Bell 1’ case, the appointment of another person already closely associated with the church through the representation of its insurers EIG did not ensure that fair process was achieved, and prompted questions not yet fully answered. Lord Carlile included in his recommendations: “The most significant (error) was that the Core Group which it established failed to follow a process that was fair and equitable to both sides” (para. 14). Given the debacle of the first Bell investigation, it is hard to imagine that any sensible person would regard the decision to deny Mrs Whitley her choice of advocate as fair and reasonable. Were it your family member’s interests at stake, who would you wish to represent them? A distinguished Queen’s Counsel or a nominee of the person who played a significant part in perpetrating the unjust process in the original unfair process? In summary, the same NST which failed to ensure fair process in the first Bell inquiry dictates the terms of the new scheme which gifts itself the power to nominate a less qualified advocate, and then exercises that power to engage someone who has no experience in defending an accused in a quasi-legal environment, and moreover assigns that role to a member of a supplier organisation which has commercial interests in the renewal of their contract. And all this against the wishes of a 93-year-old lady who relies upon the Established Church to do justice to one of its most distinguished servants. None of this is to criticise Mr Findlater, who probably knows little of these legitimate concerns. When we presented this analysis to the church decision-makers, we were told that the rationale for defending the decision was that the Carlile Report criticises the change of personnel: a perfectly adequate person was in place, and the task of nominating the person to present the case for Bell was for the NST to decide, under rules drawn up by the NST. There is no logical or practical reason why Desmond Browne QC cannot similarly act as an associated advocate, either in place of or in addition to Donald Findlater. The other members of the Group would make the decisions; Mr Browne would ensure that they take into account that which they should, and exclude that which they should not. This is such a familiar format in my former professional field of Safeguarding. When a young person is legally competent to give instructions, they may reject the opinions of the Children’s Guardian expressed through their lawyer, and engage a second of their own choice. Accordingly, at the table there are then two lawyers, not always agreeing but adding to the texture and perspectives of the case which is then considered by the decision-makers. Similar arrangements occur in care cases when the parents separate and a new advocate arrives and has to be brought up to speed. If the problem is new to you, you obviously do not have this repertoire of experience to draw upon, and that is why mistakes happen. In this case, no prejudice to the outcome has yet been manifest; no vital interest of the church or to justice has been identified and no harm advanced. Bishop Tim Thornton appeared on the BBC Today programme on Saturday and was repeatedly pressed on the subject by Justin Webb, but he offered no convincing answer. Frankly, with such a thin brief, even Desmond Browne would have struggled. Archbishop Justin ventured onto thin ice in his response to the Carlile Report, but at least even his critics acknowledge that he did so with integrity, even if they thought him mistaken or wrong. Having declared in his Synod address that there needs to be a change of culture in the church’s Safeguarding approach, how would it look if his immediate response to this dilemma were to support the NST in its compounding of the hurt to the wholly innocent Mrs Whitley, which his spokesman Bishop was wholly unable to justify when pressed? Few of the victims he encountered this past weekend would support the NST against Mrs Whitley. They are fair-minded people, and are only too familiar with bullying from the church. The Archbishop of Canterbury would not have been involved in making the decision to deny Mrs Witley her chosen advocate, so I reiterate that he is not the Unjust Judge of the parable. But his response to this controversy will need to be very surefooted if he is not to become so in the Court of public opinion. The key question is simple: when we have got it plainly wrong, does Church House apologise and put it right promptly, or do they go back to the old circling the wagons and defending the position to the bitter end, whatever the damage inflicted? I always maintained that Justice4Bell and the campaign for victims were linked by a common thread of an obdurate Church House culture. This will be the acid test of that proposition. I hope Archbishop Justin gets this right.